This week marks six months since Michael tore up the Forgotten Coast. I am proud of this community and the progress we have and are making. We are definitely recovering, rebounding and on the mend. Our real estate market has seemingly shrugged Michael off as it continues to behave as if that near Cat-5 hurricane had never crossed our way; it remains strong, this week closing four sales and attracting five new contracts. Sellers added twenty-one new listings, eighteen of which are lots in a new subdivision, with one newly listed house already under contract, and changed prices on three others. 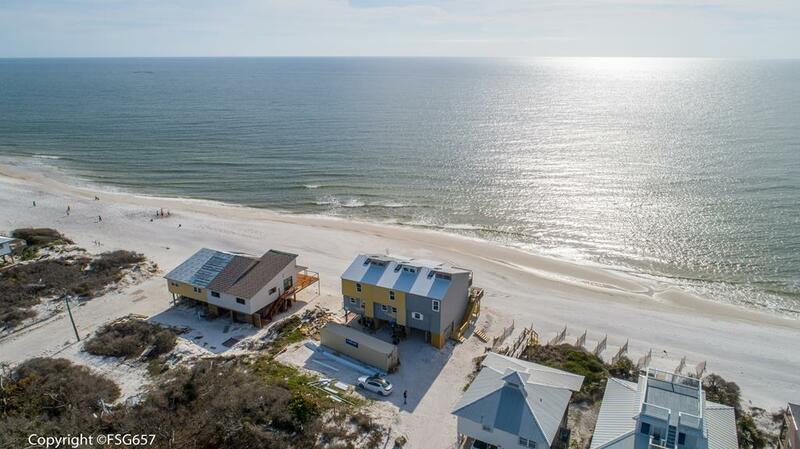 Our inventory of homes remained unchanged at 51, while our number of lots increased by seven to 193, for a total of 244 active MLS listings in the Cape San Blas, Indian Pass and C-30 Corridor market. 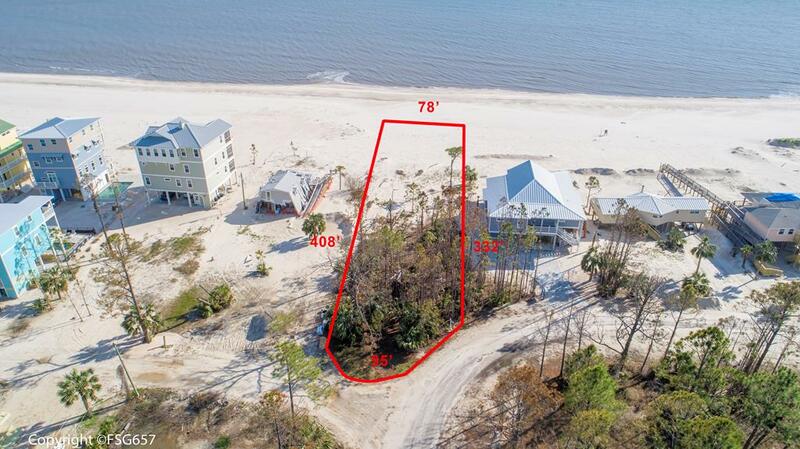 We’ll kick off our review of this week’s four sales on the south side of the Cape in Jubilation where this 92′ by 62′, 0.13-acre lot that went under contract just two weeks ago. The seller bought it in the summer of 2004 for $320,000, had it listed for $69,900, and sold it for $62,500. It has been on the market since October 2016. 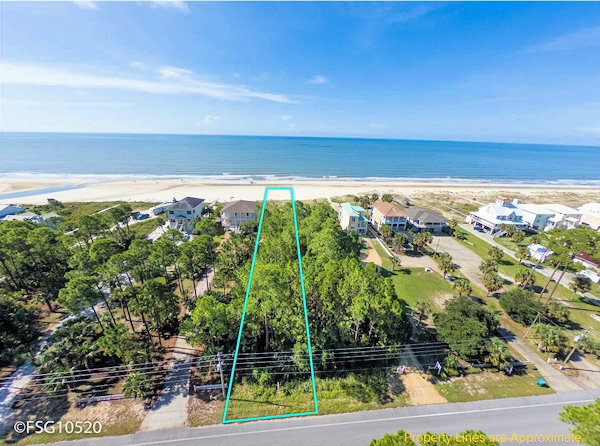 We’ll leave the Cape and head north on SR-30 towards Port St. Joe for our second sale which is a 4-bedroom, 3-bath, 1,779 square foot home listed “As Is” for $360,000. 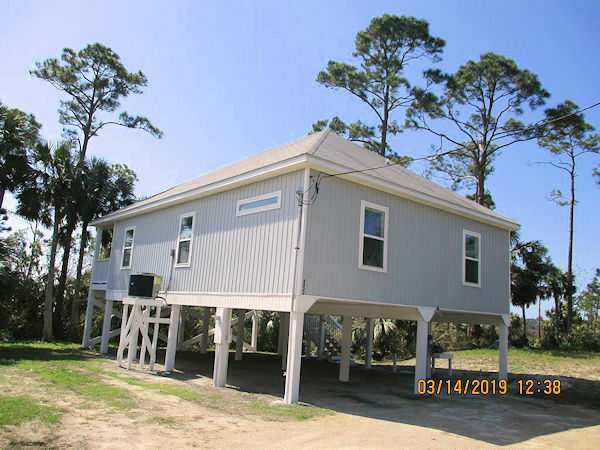 It sustained some flooding damage on the ground level from storm surge from the bay during Michael, most of which has been remediated at this point. It was listed on January 7, went under contract a month later, and sold this week for $353,000, 98% of list price. 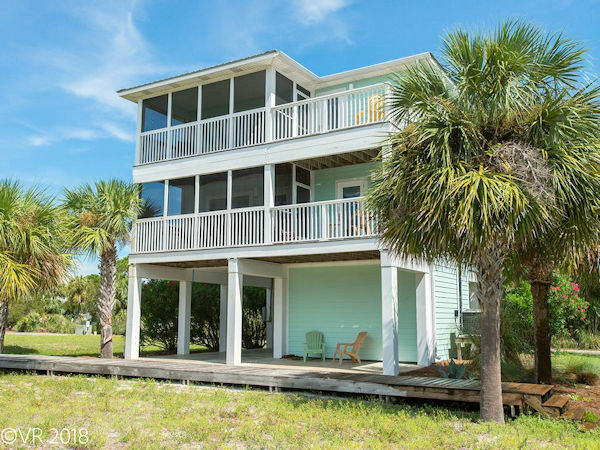 We’ll turn around and head back east along C-30 over to Gulf Pines to this lovely 5-bedroom, 4-1/2-bath, 2,678 square foot gulf front home situated on a 100′ wide stretch of beach. The sellers bought it in 1998 for $439,000, had it listed for $1,269,500 and sold it on Friday for $1.15M. This home attracted the buyer less than a month after it hit the market. 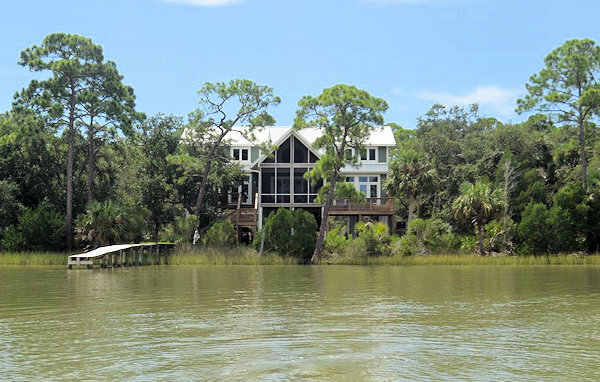 Our fourth and final sale takes us out to Indian Pass towards the eastern tip to this lovely lagoon front home tucked away on 235′ of waterfront beauty. The 3-bedroom 3-1/2-bath, 3123 square foot home was built in 2006. The sellers listed it in early 2018 for $859,000 and over time since then adjusted that price down to $799,000. On Friday the new owners picked up the keys at closing for $770,000 cash. For the first of our five new contracts we’ll return to the Cape, this time on the north end of the peninsula starting off in Hibiscus Bay and Beach, an attractive subdivision adjacent to the south side of Rish Park. 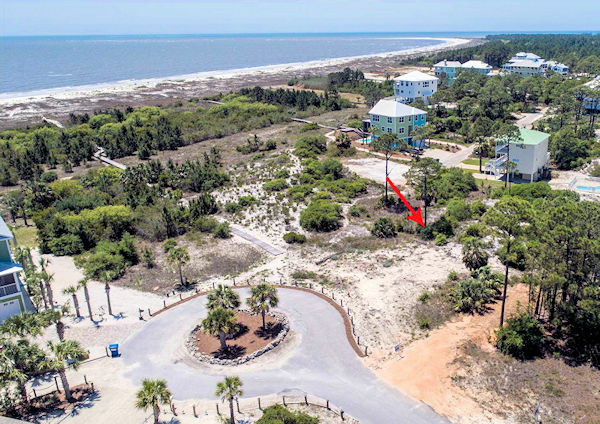 Buyers staked their claim on this irregularly-shaped 0.46-acre lot with great views from a home on pilings of both St. Joe Bay and the Gulf. 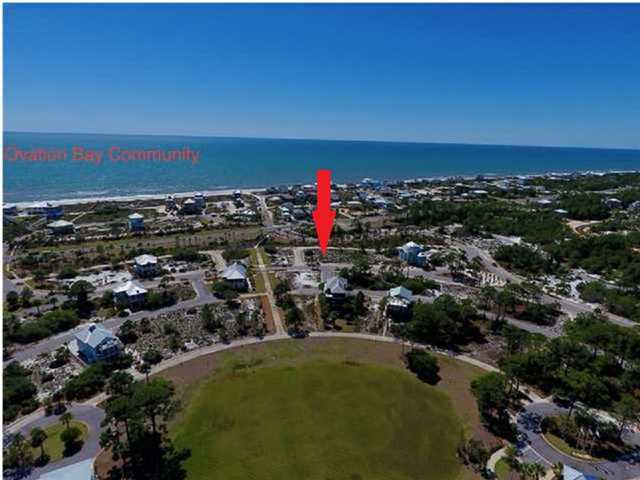 This community includes deeded gulf and bay access, a walkover out over the bay, a pool, and a walkway to the beach with a gazebo gracing the shoreline to savor our beautiful sunsets. The sellers bought it just last September for $76,000 but have decided to look for an existing house rather than build and listed it a couple of weeks ago for $86,000. Back down on the south side of the Cape on McCosh Mill Road in Piney Woods, sellers accepted an offer on their 58′ by 131′ 0.16-acre pool side lot. They bought it in mid-2015 for $114,900 and have it listed for $109,000. About a half mile down the road is Boardwalk, home to this 3-bedroom, 2-bath, 1,599 square foot home built in 1988 labeled as a fixer upper. It was listed on Wednesday for $299,900, received multiple offers within two days, and went under contract Friday afternoon. 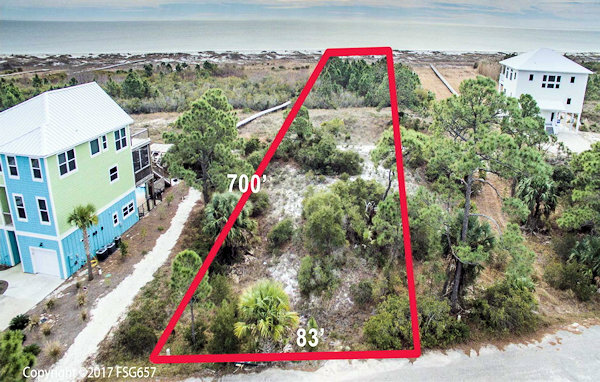 Back out on C-30 in Treasure Bay buyers had their offer accepted on this 102′ by 216′, half-acre lot listed for $54,900. This stretch has no HOA, no HOA fees and is home to single family homes, RVs and pole barns.The sellers bought the lot in 2003 for $45,000. 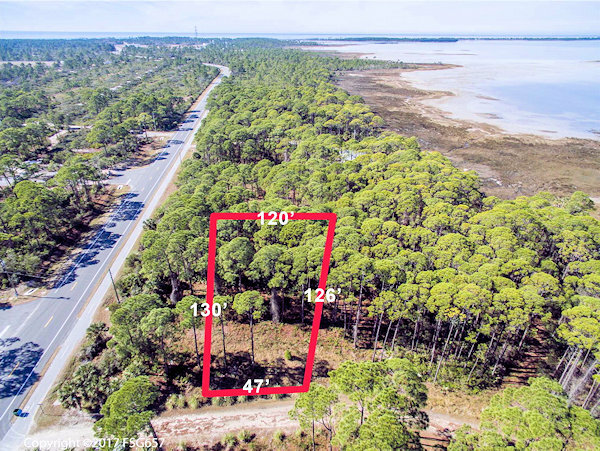 We’ll wrap things up today over in Gulf Pines with this third-of-an-acre first tier lot that went under contract on Thursday with a list price o$149,000. It last sold in mid-2017 for $187,000. That does it for today. I’m pleased to see continued steady interest in our market, meaning others realize how steadily we are recovering from Michael and getting better every day. 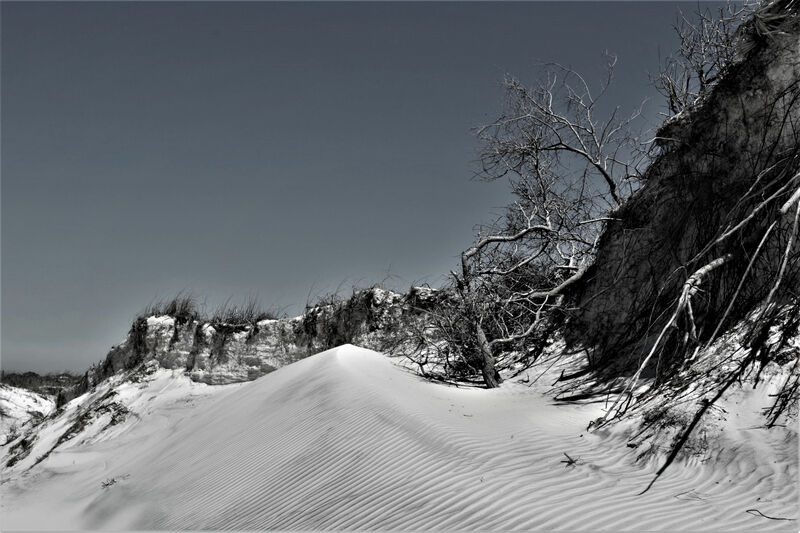 This week a client who only gets to visit here occasionally sent me some photos of how he sees the landscape of the Cape healing, one of which he calls, “On the Mend”. I loved seeing this as we most definitely are on the mend on every level. If you’re thinking of buying or selling, I’ll be glad to help you, so let’s talk. You can always reach me by calling or texting 850-227-5197 or emailing sherri@sherridodsworth.com. Either way, I hope to hear from you soon, and thank you so much for taking time out of your busy schedule to stop by today. This was an historic week for Cape San Blas and Gulf County as we finally won the first round of a 37-year battle to extricate ourselves from the Coastal Barrier Resource Act, CBRA, designation. On Wednesday afternoon, the president signed legislation passed by the House and Senate removing 40 acres of the Cape from CBRA. The area includes Cape Breezes subdivision and Rish Park. This establishes precedent that will allow the county to move forward with a sound argument for seeking removal of the roughly 900 remaining acres of the vicinity from the federal designation that prohibits any sort of FEMA funding for properties within those areas. This has been a bipartisan effort of regional representatives and highly engaged local citizens for nearly four decades and it is so gratifying to finally see some progress. Our inventory is at an historic point as well, at least for the twelve years I’ve been writing this blog. When I first started writing this in the summer of 2007, our inventory stood at 552, with 200 homes and 352 lots listed for sale. Nothing was moving. 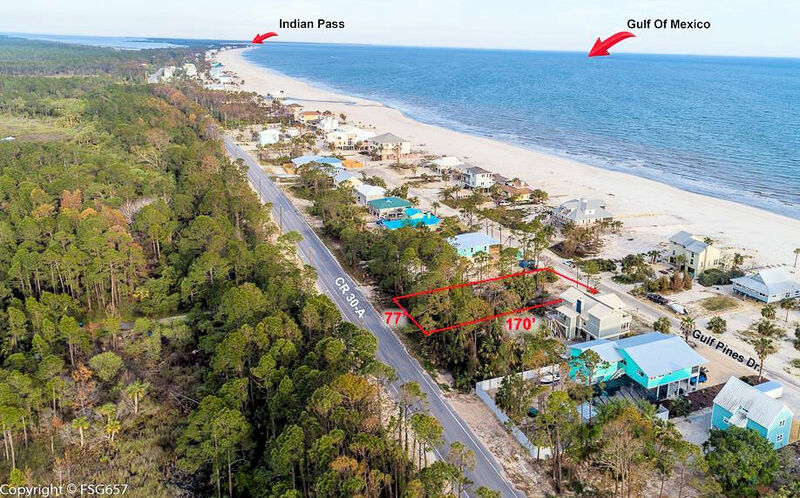 We ended this week at the lowest level since then, down two from last week, closing at 231 total, with 51 homes and 180 lots listed for sale in the Cape San Blas, Indian Pass and C-30 Corridor MLS market. Properties are moving. We closed three sales and wrote contracts on five others. We put For Sale signs on ten new listings, and changed prices on five others. Let’s see what buyers are snapping up. Oddly enough, none of this week’s three sales were on the Cape. The first two are out along the C-30 Corridor, starting in Money Bayou, a pleasant little old Florida neighborhood with no HOA or HOA fees. 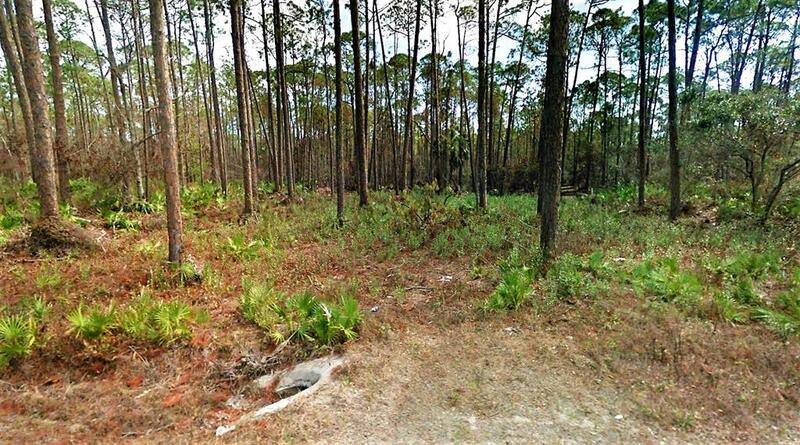 This miniscule 35′ by 80′, 0.064-acre, second tier AE lot first went under contract on February 8. That one didn’t work out and it re-entered the MLS four days later on February 12. It went back under contract on February 27 with a list price of $89,000, and on Monday the new owners took title for $85,000. We’ll continue traveling east along C-30 towards the Indian Pass Raw bar stopping at Treasure Shores where this 3-bedroom, 2-bath, 1,469 square foot gulf view home on a little over half an acre on the north side of C-30 went under contract the last week of January with a list price of $335,000. The home sustained some damage from Michael, most of which has already been repaired. The seller bought the place in early 2004 for $290,000 and handed over the keys to the new owners on Monday for full list of $335,000. 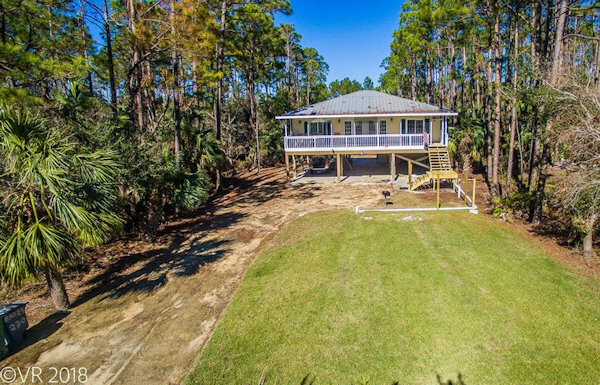 Our third sale is one of those post-Michael fixer-uppers with an alluring price that buyers are jumping on. 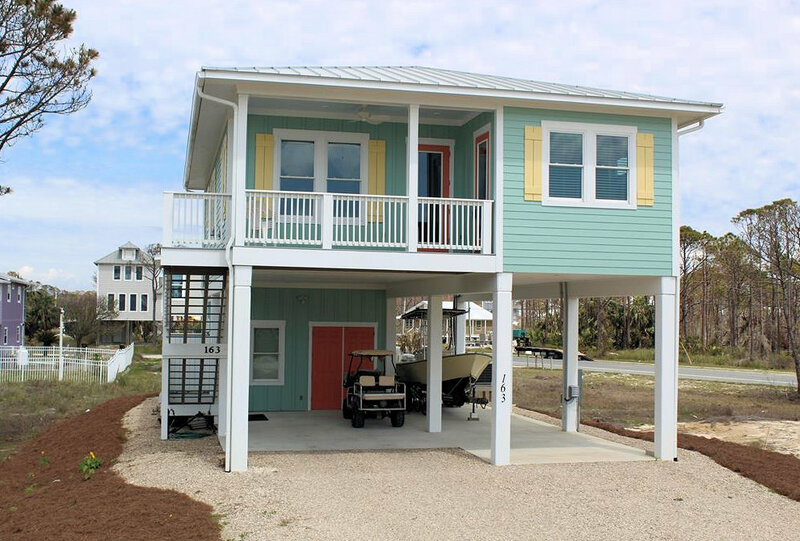 This one is out on Indian Pass; it’s a 4-bedroom, 2-1/2-bath home on a 50′ gulf front lot listed less than 3 weeks ago for $550,000. There’s a new roof and is being sold “As Is”. As you can see in the photos, it still needs some work and is being sold primarily unfurnished. The seller bought it in 2004 for $1,083,500, had it listed for $550,000, received multiple bids, and sold it on Friday for $575,000. Now onto our five new contracts, heading to the Cape for the first time today, up on the north side in Barrier Dunes to one of just a handful of single family homes in that subdivision of primarily townhomes. This 3-bedroom, 3-bath, 1,994 square foot rental home went under contract last weekend with a list price of $419,000. The sellers bought the lot on which it’s situated in late 2009 for $85,000, and built the house the following year. Since then it has been a successful rental property, and is being sold turn-key. 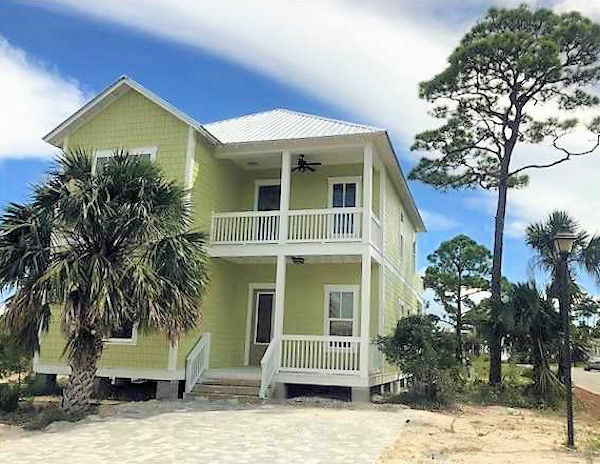 A couple of a miles south of Barrier Dunes in Feather Sound on Catamaran Drive our second contract is on a 3-bedroom, 3-1/2-bath, 2,427 square foot home with an elevator and both bay and gulf views. 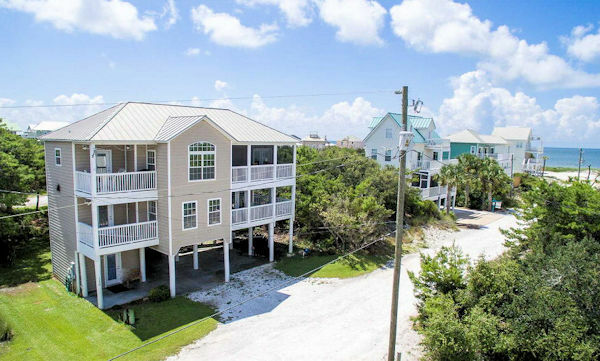 Feather Sound is a classic old Florida, laid back neighborhood with no HOA or HOA fees, and dolomite streets leading straight down to the beach access. This home last sold in mid-2013 for $350,000, and is being sold turn-key with a list price of $589,900. Our third new contract takes us to the south side of the Cape in Jubilation where this newly-built 4-bedroom, 3-1/2-bath, 2,490 square foot home went under contract on Tuesday with a list price of $569,900. The builder bought the 50′ by 80′, 0.10-acre X-zone lot in August 2017 for $56,800. About a quarter of a mile down the road in Piney Woods on McCosh Mill Lane, sellers accepted an offer on their 3-bedroom, 2-bath, 1,224 square foot gulf view home listed for $419,000. They bought it in early 2017 for $370,000, and since our new MLS doesn’t always carry over photos from past listings, I can’t determine what, if any, improvements they’ve made to the house in either upgrades or furnishings since then. 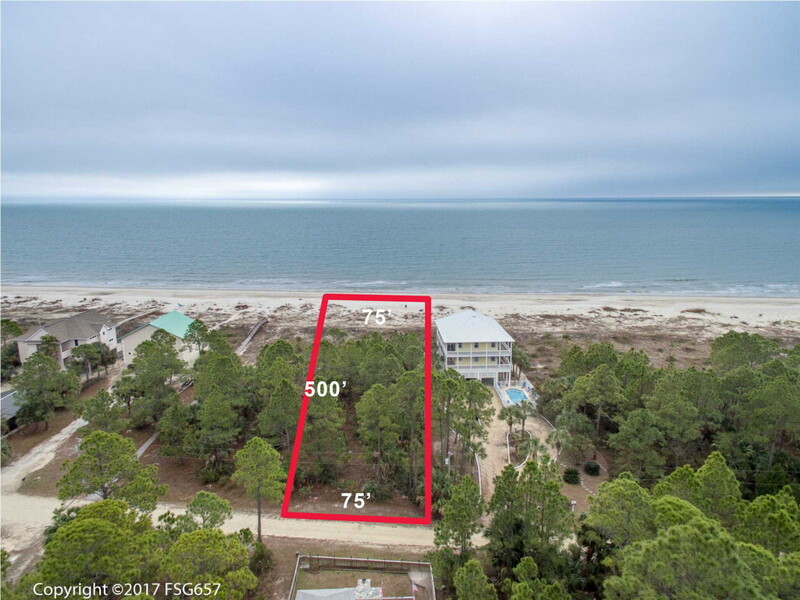 We’ll wrap things up today back out on C-30 where this 62′ wide, 654′ deep, 0.74-acre gulf front lot went under contract with a list price of $319,000. This is a FEMA eligible area. The sellers bought it back near the height of the market in mid-2003 for $450,000. And that brings us up to date. As a Cape resident, it’s comforting to see continued interest in our area, not just with real estate, but with the visitors returning as well. So many young spring breakers have been here this past week; they’re good kids enjoying our beaches and bay; some also volunteering to help with recovery efforts which is amazing when they could just be relaxing during some well-deserved time off from their studies. Makes me happy to see them out riding bikes, kayaking, hanging out eating ice cream treats together taking selfies, and laying out on the beach. If you’ve been considering buying or selling here, I’d love to help you. It’s never too early to start, so even if you’re still in the very early exploration phase of maybe in the next year or so we might want to explore this crazy idea, let me know. Call or text me at 850-227-5197 or send me an email to sherri@sherridodsworth.com. Have a terrific week, and thanks so much for stopping by today. Warmer spring-like weather may be slowly returning, but our market is red hot. We closed five sales, wrote up six new contracts, added a whopping twenty-one new listings, and made four price changes. 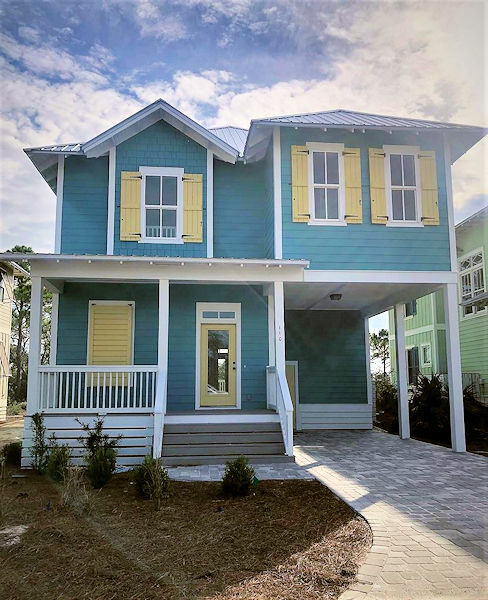 Our inventory of MLS listings in the Cape San Blas, Indian Pass and C-30 market closed the week at 233, up six from last week, with 51 houses and 182 lots for sale. It has been the best week we’ve had since Michael with lots to report so let’s get right to it. The first of our five sales is a 4-bedroom, 3-bath, 1,871 square foot first tier home on Sugar Loaf Lane just a little south of Scallop Cove. The sellers bought the lot on which it’s located for $110,000 in the summer of 2012 and completed construction on the home just three years later in 2015. They listed the house for sale last August for $689,000, accepted an offer on it in late January, and sold it on Wednesday for $675,000. We’ll wander down to the south side of the Cape for our second sale which is this irregularly shaped quarter-acre bay view lot in Eventide. 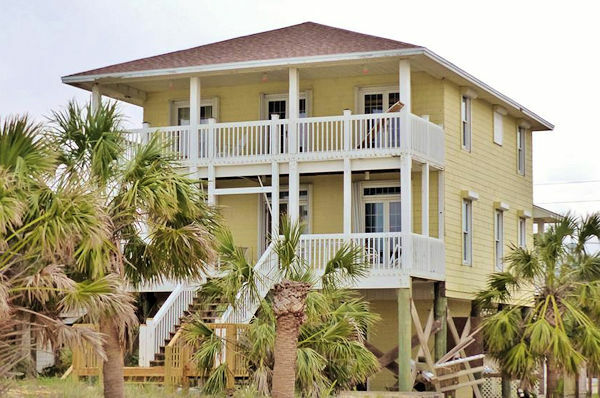 This neighborhood is directly across the street from San Blas Plantation, and the two have reciprocal agreements for the property owners to each other’s deeded waterfront access; San Blas Plantation grants gulf access for Eventide owners, and Eventide owners grant San Blas Plantation owners bay front access. Bit of an unusual situation here in that the owner of this lot has it listed for $40,000, which is exactly what he bought it for in mid-2002. It closed on Wednesday for $36,000. Our third sale is out on C-30 past the Indian Pass Raw Bar. In mid-February, sellers accepted an offer on their 3-bedroom, 3-1/2-bath, 2,000 square foot home in a lovely country setting. It was built in 2000 on a 200′ by 200′, 0.92-acre lot. They bought the home in February just last year for $335,000, listed it for $379,000, and handed the keys to the new owners this week of $370,000 cash. 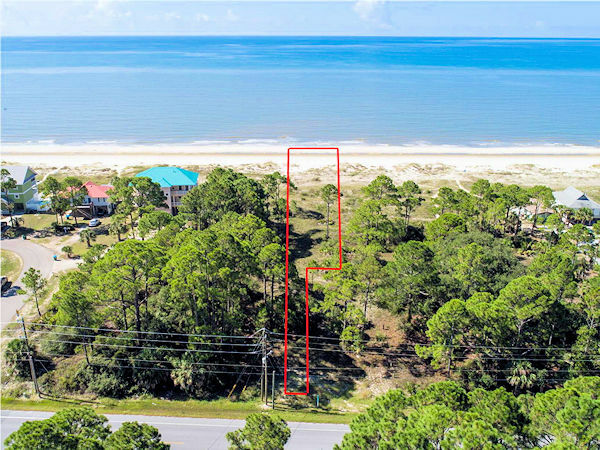 Sale number four is this third-of-an-acre, first tier corner lot in Treasure Shores with awesome gulf views. The sellers bought it way back in 1997 for $32,500 – those were the days! It’s FEMA eligible and this subdivision has no HOA fees – sweet. 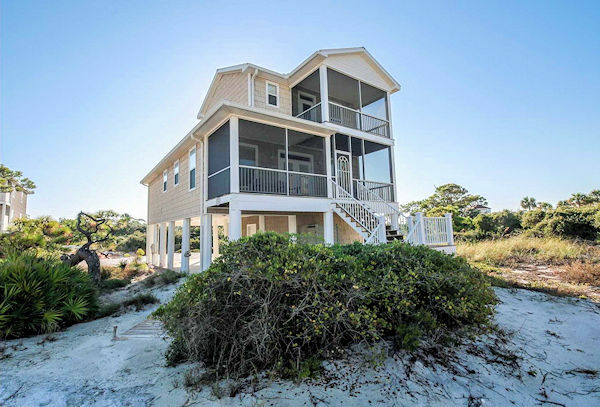 All properties here include deeded gulf access. It has been on the market since July with a list price of $179,000, went under contract the first week of January, and the happy new owners took title on Tuesday for $160,000. 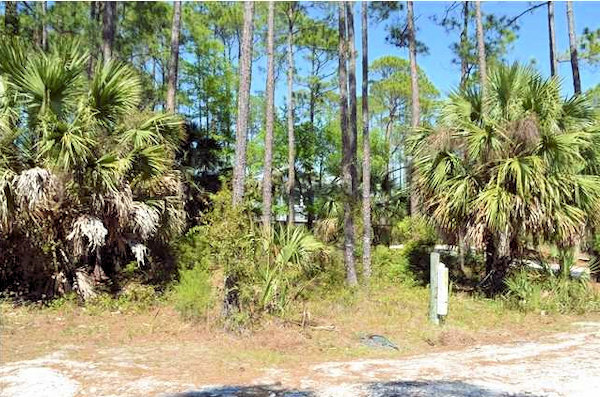 Let’s travel on over to Indian Pass for our fifth sale, to this 90′ by 340′, 0.7-acre canal front lot on Painted Pony Road in Indian Summer. 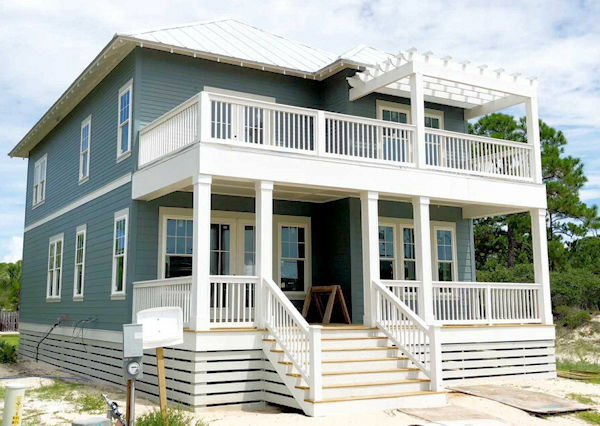 This pretty little Old Florida beach neighborhood has a totally laid back vibe and sits tucked away on the gulf at the full curve on Indian Pass Road. 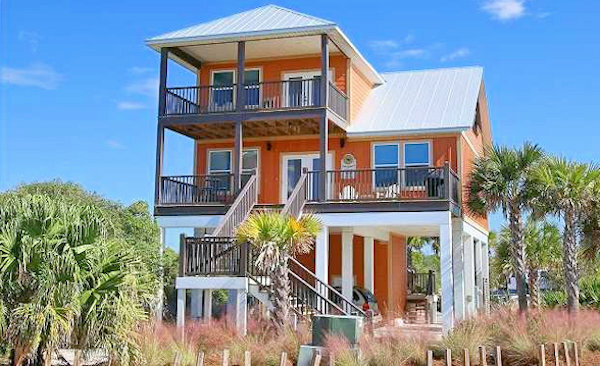 All properties convey with deeded gulf access, and there is a pretty community pool overlooking the Gulf. The seller bought this lot just last year in January 2018 for $102,000, and had it listed for $98,000; he signed it over to the new owner on Thursday for $62,000 with seller financing. Now on to our six new contracts starting off with this irregularly-shaped 0.15-acre first tier lot in Monarch Beach listed for $223,000. 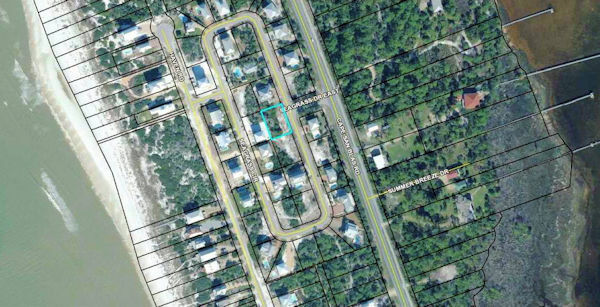 Platted in 2017, this little subdivision is located on the Cape just a bit south of Rish Park and Hibiscus Beach. It has modest annual HOA fees of only $250. Not too far down the beach is Jubilation, home to our second contract. Buyers fell in love with this handsome 4-bedroom, 3-bath, 2,072-square foot gulf view home listed for $619,000. It was built in 2006 and last sold in 2013 for $439,000. It’s a good rental property named “Pottery Barn” which tells you something about the furnishings it is being sold with. We’ll return to the south side of the Cape, this time stopping in at Jubilation where this 4-bedroom, 4-1/2-bath, 2,574-square foot gulf view home went under contract with a list price of $629,900. Jubilation is a gated community built by Ashwood Development, the same folks who brought us Ovation on the north side of the Cape. This attractive neighborhood of handsome homes such as this includes a community pool overlooking the gulf. About half a mile down the road is Southbeach, another gated community on the gulf. Our fifth contract is on a quarter-acre interior lot measuring 100′ by 120′ and listed for $99,900, double the $50,000 the owners paid for it in early 2015. Southbeach has a walkover to the beach and deeded gulf access for all owners, but no community pool. 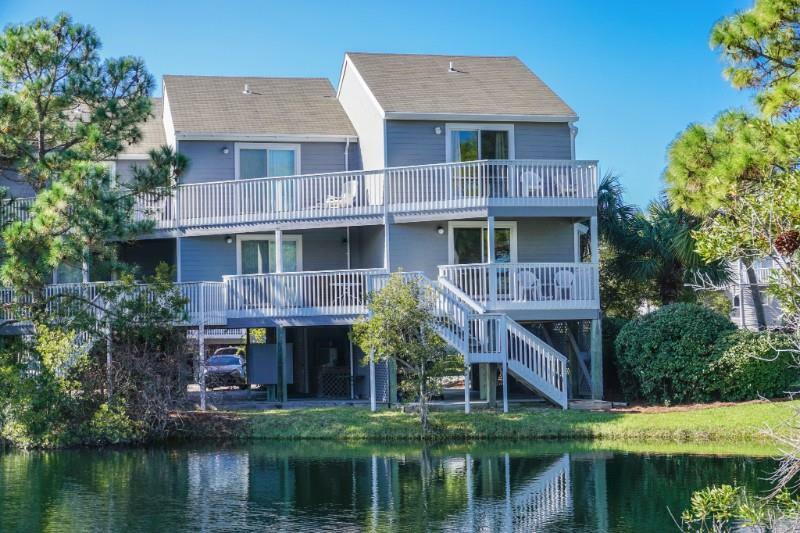 For our fifth contract we’ll go out onto C-30 and travel east a few miles past the Indian Pass Raw Bar, to this 3-bedroom, 2-bath, 1,200 square foot home overlooking Indian Pass Lagoon. 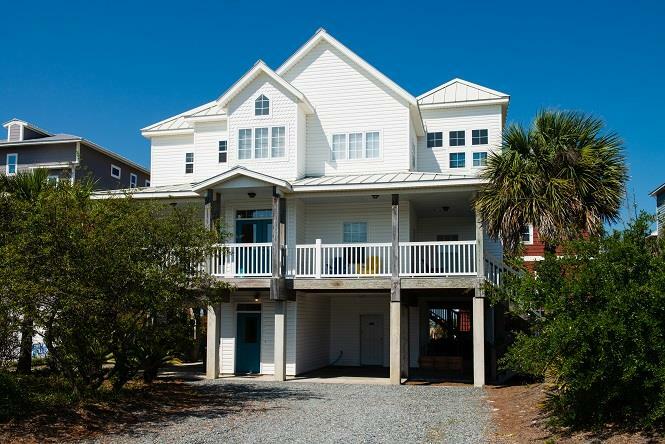 The waterfront home was built in 2008 and is being sold unfurnished for $274,000. The sellers bought it in early 2017 for $204,000. 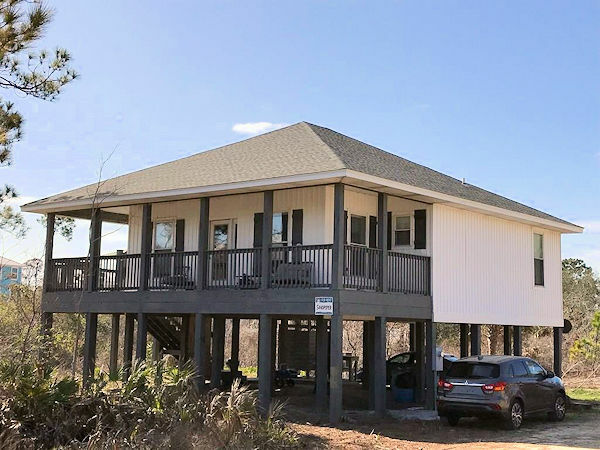 Our sixth and final new contract is one of those post-Michael fixer uppers at an appealing price that buyers are jumping on. 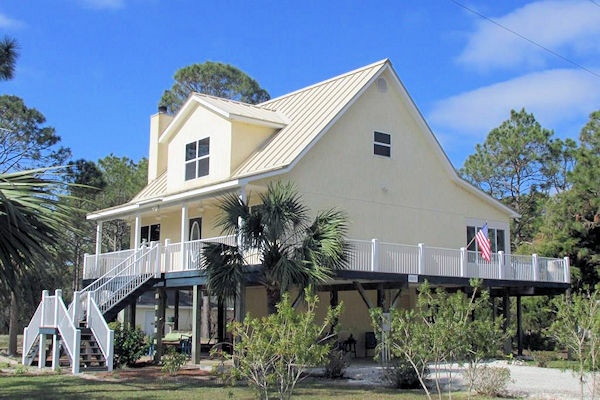 This one is out on Indian Pass; it’s a 4-bedroom, 2-1/2-bath home on a 50′ gulf front lot listed less than 2 weeks ago for $550,000. It has a new roof and is being sold “As Is”. As you can see in the photos, it still needs some work. It’s being sold primarily unfurnished. The seller bought it in 2004 for $1,083,500, and has it listed for $550,000. That does it for this week. Our recovery progress is truly impressive and we’re looking forward to sharing with our returning visitors just how far we’ve come in the past five months. One week from today, March 15, is the deadline for taking storm debris to the street for FEMA pickup, so after that we should start seeing the end to those piles of debris which will be as welcome a spring sight for us as blooming flowers are any other spring. As you’ve just seen, Michael hasn’t left a lasting mark on our real estate market, so if you’re thinking of selling or buying, let’s get together and talk. Call or text me at 850-227-5197 or drop an email to sherri@sherridodsworth.com . I hope all is well with you and yours, and thank you so much for taking time to stop by today. Hope to hear from you soon. The calendar may have said late February, but the weather said spring as we’ve had warm albeit damp weather, resulting in the return of oh so welcome glimpses of greenery to our landscape. Many of our scrub oaks, barren and brown since Michael, are showing signs of recovery with little green leaves re-emerging. Our market remains warm as well, with two sales and six new contracts. Sellers added twelve new listings and changed prices on four others. 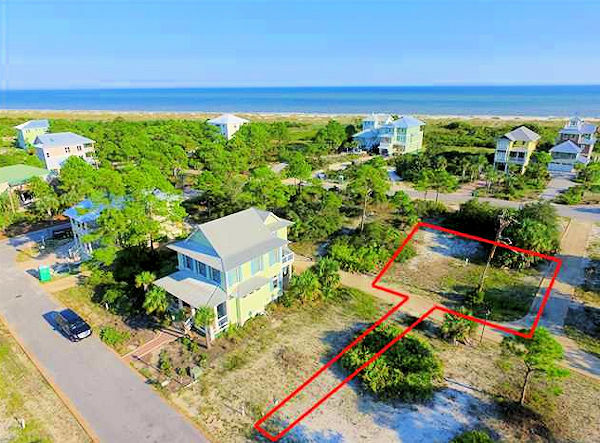 Our inventory shed six, closing the week at 227, with 58 homes and 169 lots listed for sale in the Cape San Blas, Indian Pass and C-30 Corridor MLS market. The first of this week’s two sales is on the bay side of the Cape directly across the street from Seagrass. 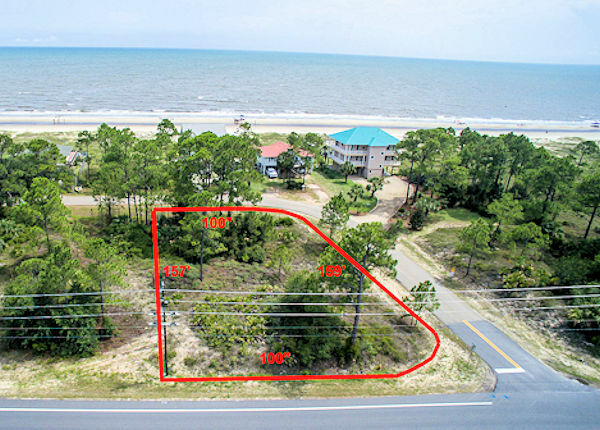 Less than a month ago buyers jumped on this 100′ by 800′, 1.85-acre bay front lot the very day it was listed for $279,000. The family who owns this lot and the adjacent multi-acre parcel have owned both for quite some time so no sales data is available on the county appraiser’s site. On Tuesday the deal was done and the new owners took title for $250,000. 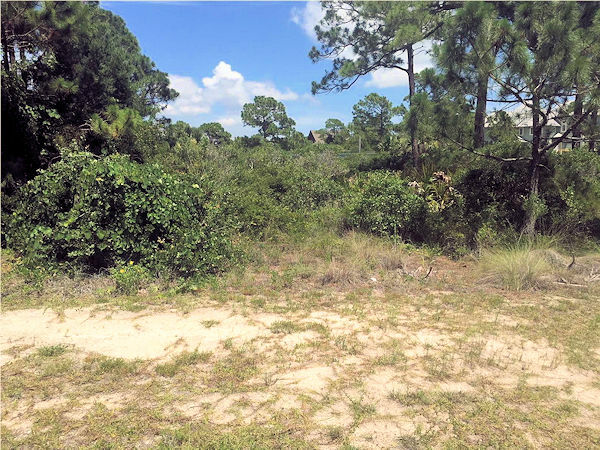 Down on the south side of the Cape, buyers were attracted to these two adjacent lots on Mercury Lane in Surfside Estates listed for $142,000. Together they measure 100′ x 230′, for a total of 0.54 of an acre. 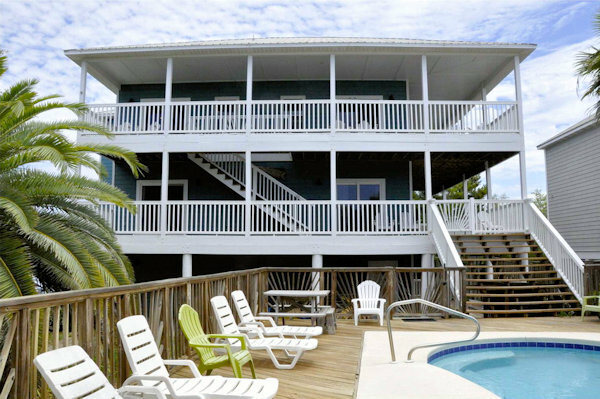 They sit first tier and offer excellent views of the Gulf as well as easy access to the beach. The seller bought the two lots in 1999 for $114,000 ($172,240 in today’s inflation-adjusted dollars), and sold them on Friday for $125,000. Now on to our six new contracts starting with one of just a small handful of commercial buildings on the Cape. When I moved here in 1994, this place was a cheerful little eatery known as The Cape Café, and it was the only place to eat out on the entire peninsula. The café closed in 1998, the restaurant equipment is long gone, and the building has been sitting vacant since then, save for a brief period where a thrift store operated out of it. The current owners bought it in mid-2016 for $290,000, have done a little renovating since then, and have had it listed for some time at $399,000. Somebody stepped up to the plate last weekend and made an acceptable offer to the sellers. 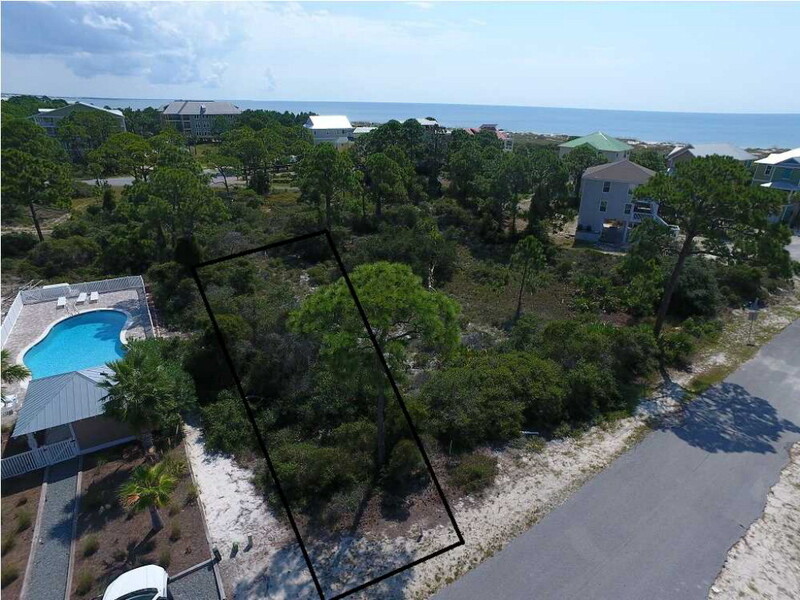 Our second contract is on a 75′ by 112′, 0.19-acre fourth tier gulf view lot on the Cape peninsula in The Preserve at the Cape. The Preserve is located south of Rish Park and just north of Seagrass. This was a direct sale from the developer so no sales history on it. The developer put it on the market last July with a list price of $139,000, lowered it to $129,000 in August, and reduced once more two weeks ago to $119,000 which apparently was the sweet spot as it went under contract on Tuesday. 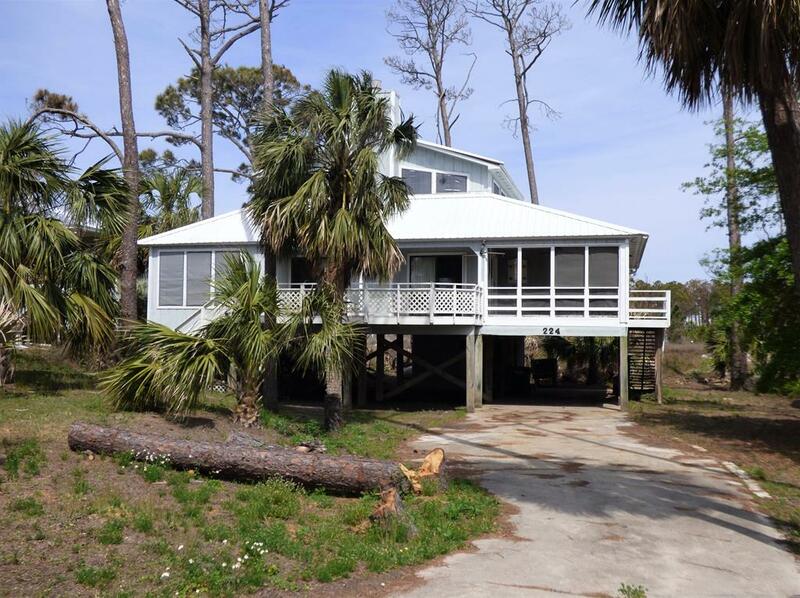 We’ll return to the south side of the Cape heading over to Plover Drive in San Blas Plantation where this 3-bedroom, 2-1/2-bath, 1,620 square foot home listed for $389,900. It was built on a half-acre lot in 2005. The sellers bought it in a bank-owned sale in 2010 for an unbelievable $153,000. 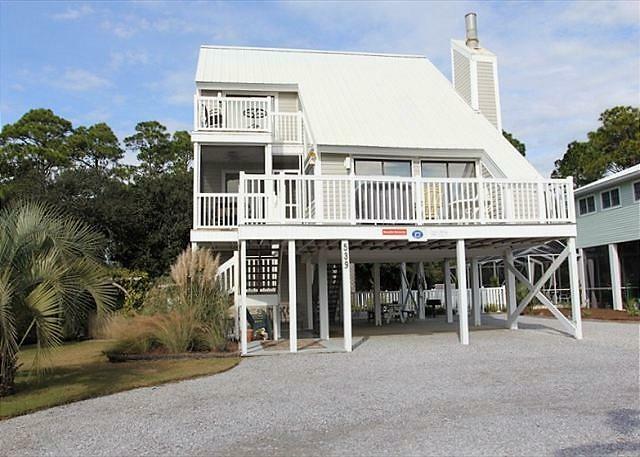 Let’s leave the Cape for the first time today and travel east along C-30 over to Gulf Pines to this lovely 5-bedroom, 4-1/2-bath, 2,678 square foot gulf front home situated on a 100′ wide stretch of beach. The sellers bought it in 1998 for $439,000, and have it listed for $1,269,500. Further east along C-30 is Money Bayou, home to our fifth contract. This one might look a bit familiar as we saw it here on February 8 when it previously went under contract. That one didn’t work out and it re-entered the MLS four days later on February 12. 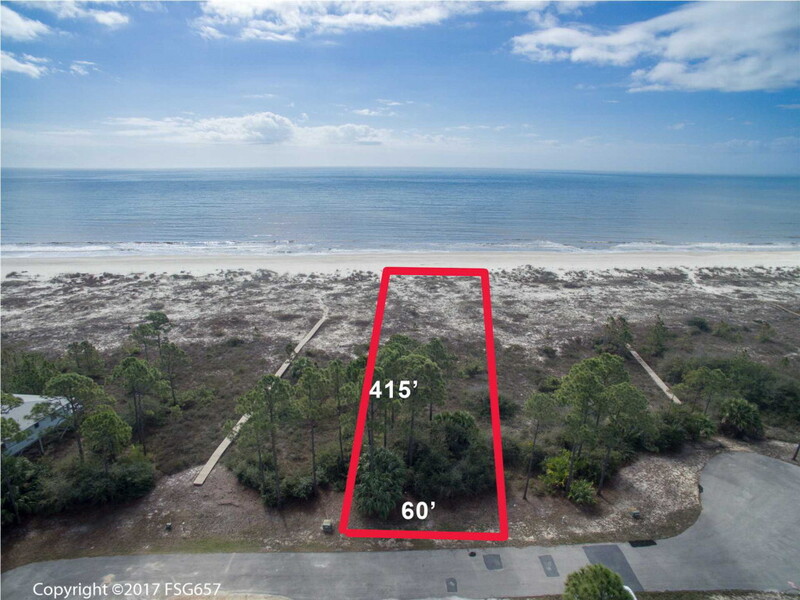 This miniscule 35′ by 80′, 0.064-acre, second tier AE lot went back under contract on Wednesday with a list price of $89,000. This pleasant little old Florida neighborhood has no HOA or HOA fees. Our sixth and final new contract takes us over to Indian Pass to this lovely 3-bedroom, 3-1/2-bath, 3,123 square foot home overlooking 235′ of frontage on Indian Pass Lagoon. The sellers bought the half-acre lot in 2002 for $225,000 and built the home a couple of years later. That brings us up to date for this week. You can see how our inventory of homes is growing smaller and smaller as demand increases. If you have been considering selling, let me know and I will be glad to do a comparative market analysis (CMA) for you without cost or obligation to see what it will likely bring in our current market. You can always reach me by calling or texting 850-227-5197 or emailing sherri@sherridodsworth.com. Hope to hear from you soon, and, as always, I thank you so very much for taking time out of your busy schedule to stop by today. Quick note to let you know it has been one crazy busy week for both our real estate market and me personally. Lots to write about for you, more than I can do justice to starting this late on Friday night, so I am going to finish up in the morning, take time to do it well, and hopefully have it posted for you by noon. Hope to see you then! We locals were all happy this week to have the roadway through Simmons Bayou re-open so we could say good-bye to the dreaded detour through Country Club Road, and the road repairs along Constitution Ave./Hwy. 98 being completed so the irritating temporary stoplights in Port St. Joe that have plagued us throughout that project were finally removed. The work through Stumphole continues to impress – FDOT is really beefing up that stretch this go round. Our real estate market continues to impress as well, with two sales and five new contracts. Sellers added five new listings and made price adjustments on two others. 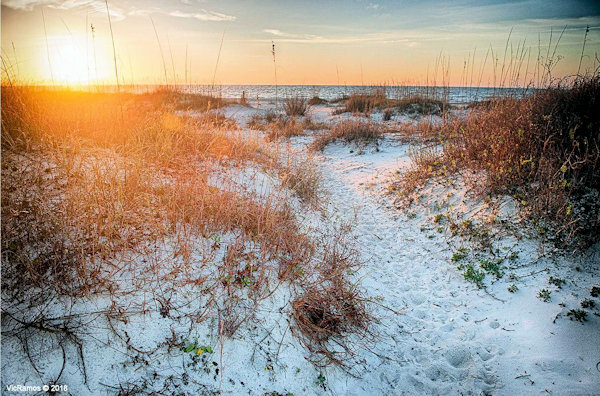 Our inventory took a healthy dip, closing the week down by three at 233, with 61 homes and 172 lots listed for sale in the Cape San Blas, Indian Pass an C-30 Corridor MLS market. 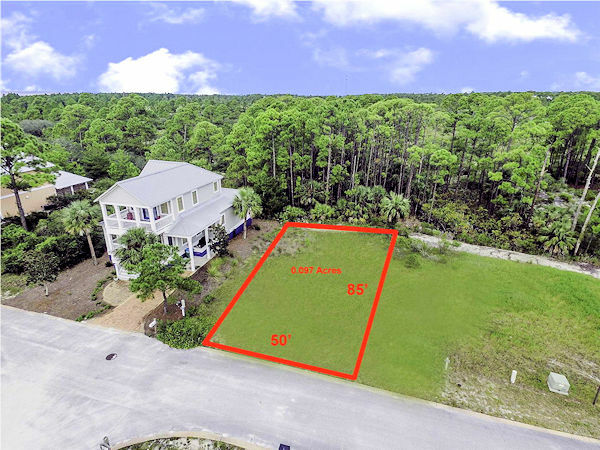 The first of our two sales is a fourth tier, gulf view lot in Seagrass listed for $149,000. The owners acquired the 88′ by 124′, quarter-acre property in mid-2013 as a bank-owned sale for $72,500. Prior to that, it sold in early 2005 for a whopping $435,000. 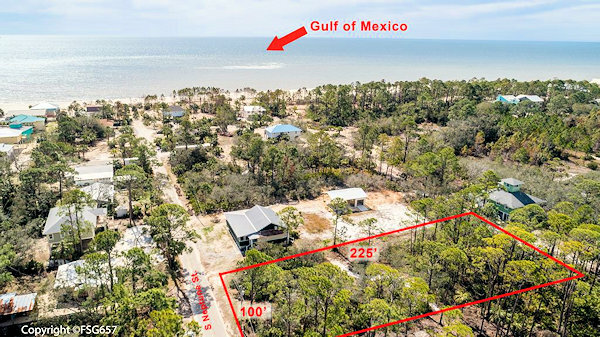 Our second sale takes us down on the south side of the Cape in San Blas Plantation to Sanddollar Drive to this 85′ by 722′, 1.22-acre gulf front lot listed for a steal at $289,000. That’s a far cry from the $84,000 the seller paid for it way back in 1988. According to my handy dandy inflation calculator, in today’s inflation-adjusted dollars that’s equivalent to $186,791.34. On Friday the parties went to the closing table with the new owner taking title for $275,000 cash, or $3,235 per waterfront foot. 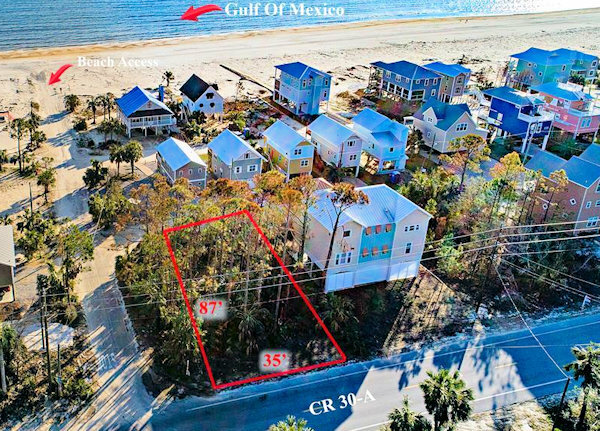 Contrast that with the last five gulf front lot sales on the north end of the peninsula that averaged roughly $8,800 per waterfront foot, with 2 of those sales coming in at $10,000/wff or above. We’ll stay on the south side of the Cape for the first of our five new contracts which is on this irregularly shaped quarter-acre bay view lot in Eventide. 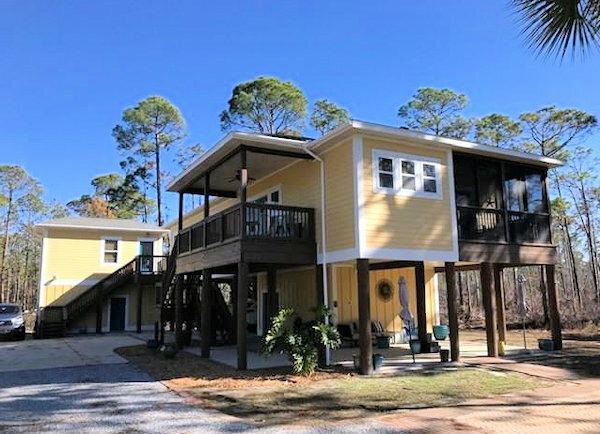 This neighborhood is directly across the street from San Blas Plantation, and the two have reciprocal agreements for the property owners to each other’s deeded waterfront access; San Blas Plantation grants gulf access for Eventide owners, and Eventide owners grant San Blas Plantation owners bay front access. Bit of an unusual situation here in that the owner of this lot has it listed for $40,000, which is exactly what he bought it for in mid-2002. Contract number two is on a bay view lot in Treasure Bay on the east side of C-30. 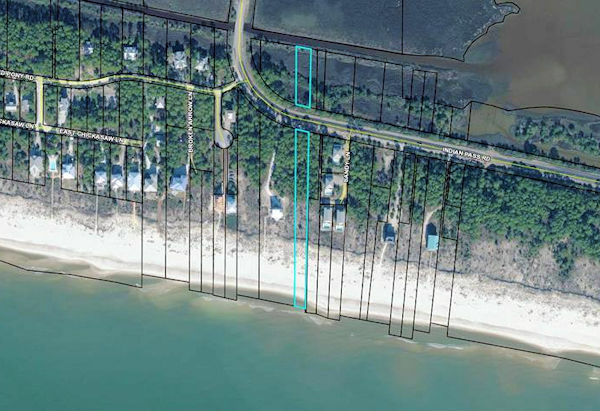 The half-acre lot is in an AE flood plane and measures 103′ by 217′. The seller bought it at the height of the real estate boom in 2004 for $120,000, and has it listed for $29,500. 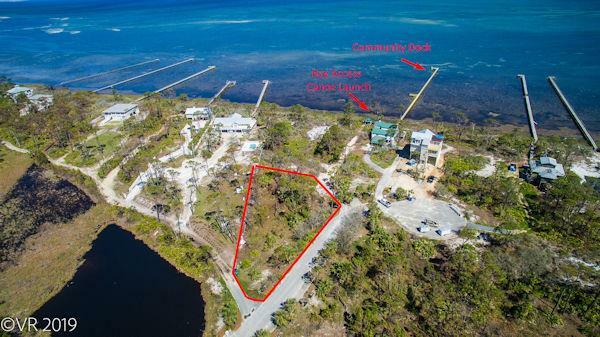 We’ll circle back on C-30 heading out towards Indian Pass Raw Bar for our third contract which is on this 50′ by 577′, 0.66-acre AE flood plane gulf front lot listed for $299,000. According to records on the County Clerk’s site, the seller bought this lot in 2005 for $1,207,500. I checked the warranty deed to make sure that wasn’t a multi-parcel sale but no, the deed warrants only this piece of land. Wow. 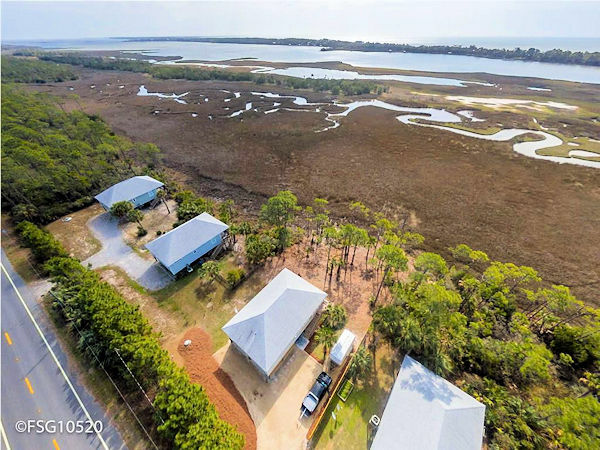 Let’s travel on over to Indian Pass for our final two new contracts, kicking off with this 90′ by 340′, 0.7-acre canal front lot on Painted Pony Road in Indian Summer. 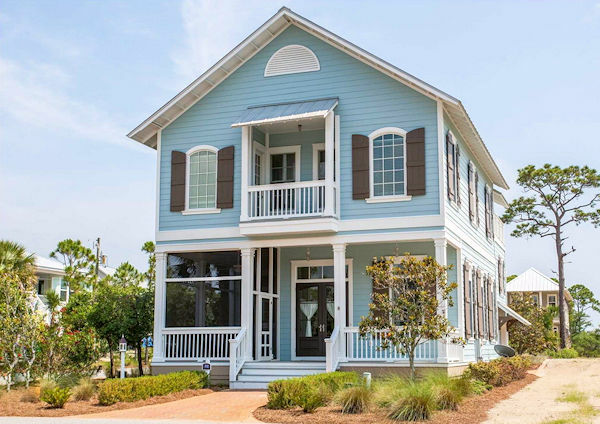 This pretty little Old Florida beach neighborhood has a totally laid back vibe and sits tucked away on the gulf at the full curve on Indian Pass Road. 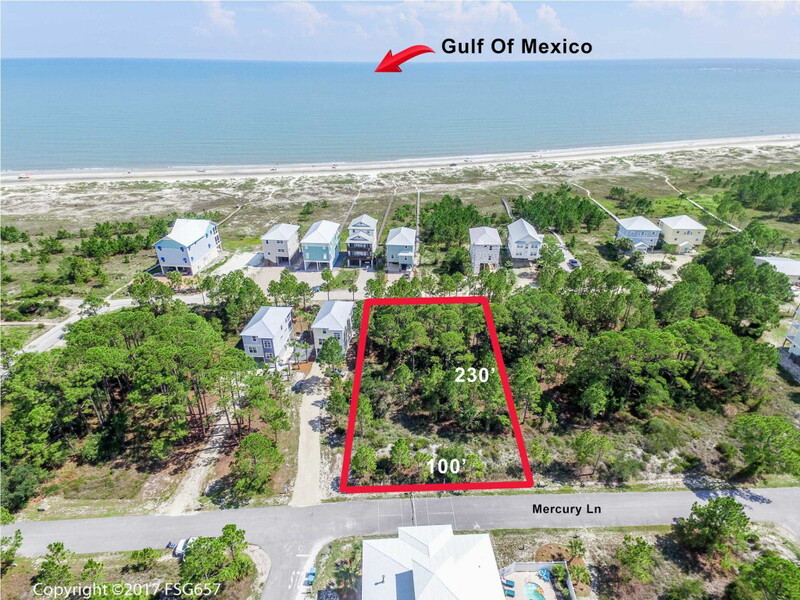 All properties convey with deeded gulf access, and there is a pretty community pool overlooking the Gulf. The seller bought this lot just last year in January 2018 for $102,000, and has it listed for $98,000. Plans change sometimes, I guess. Housing remains in critical demand locally, so if you have a house, townhouse or condo you’ve been considering selling, now is a good time to run the numbers, even if it sustained hurricane damage. We can make adjustments for that, so let’s talk. I can help you with no charge or obligation. You can always reach me by calling or texting 850-227-5197 or emailing sherri@sherridodsworth.com. Hope to hear from you soon, and, as always, I thank you so very much for taking time out of your busy schedule to stop by today. Our road to recovery this week manifested itself literally in our roads being recovered, with major impressive shoring up underway through not just Stumphole, but also along 98 through Simmons Bayou, with the detour route along Country Club Road receiving reinforcements to its shoulders, and repairs to 98 along Constitution Drive in Port St. Joe. Our real estate road to recovery continues as well as we closed three sales and wrote up three new contracts. Sellers added six new listings, and changed prices on three others. 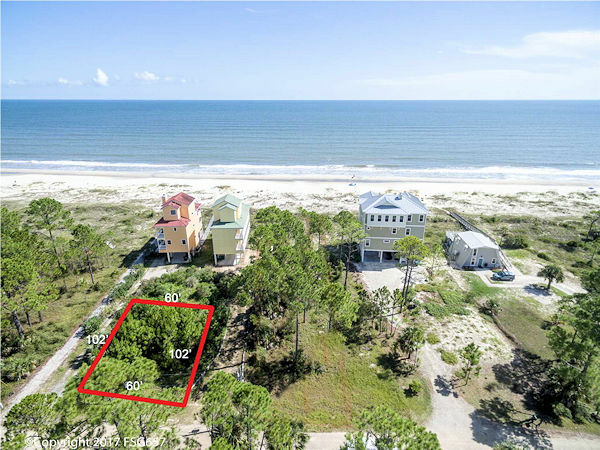 Our inventory remains unchanged overall from last week closing out at 240, with 60 homes and 180 lots listed for sale in the Cape San Blas, Indian Pass, and C-30 Corridor MLS market. 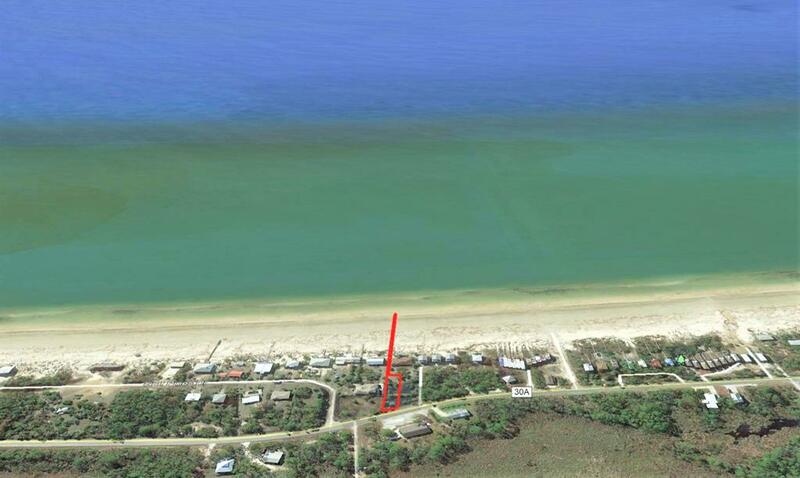 The first of our three sales is a bay view lot in Ovation towards the north end of the Cape. The sellers bought this 105′ by 50′, 0.11 acre property in late 2013 in a bank-owned sale for $27,000. Last month they put it under contract with a list price of $39,900, and on Friday signed over the title to the new owners for $35,000. 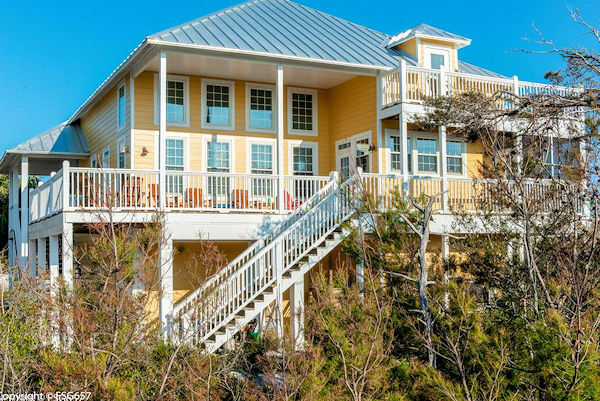 Sale number two is a 4-bedroom, 3/2-bath, 3,400 square foot gulf view home located just a bit north of Scallop Cove. The sellers bought it as a bank-owned sale in mid-2009 for $515,000, had it listed for $699,000, and sold it on Friday for $649,000. 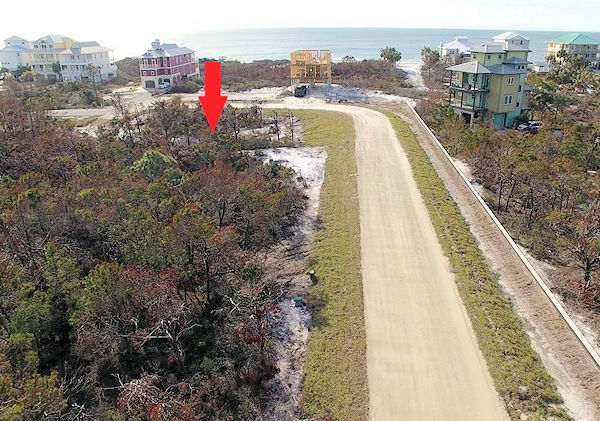 The MLS notes make no mention as to what or if damages were sustained by Michael, but as it is up along Cape San Blas Road it may not have been of consequence which the closing price seems to bear out. 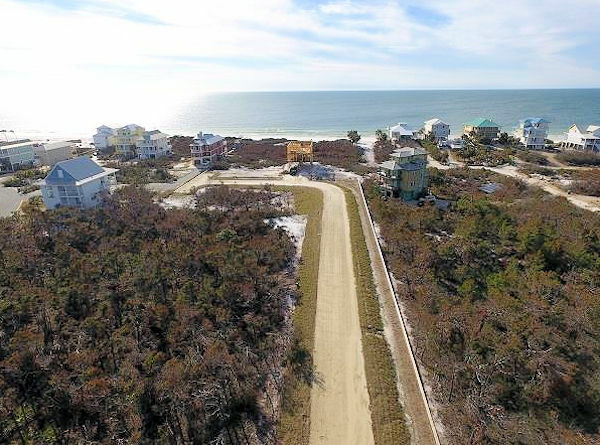 For our third sale, we’ll turn right off of Cape San Blas Road and head over to Curve at the Cape, the first subdivision on your right after leaving the Cape. 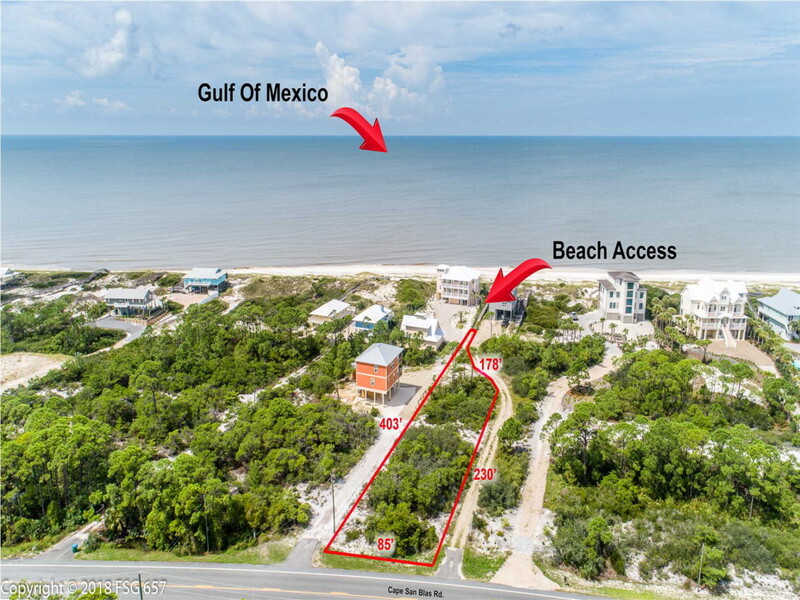 Here buyers were attracted to this 60′ wide gulf front lot. The sellers bought the property in 2016 for $250,000, a far cry from the $650,000 it commanded back in the summer of 2004. It was originally listed in September of last year for $294,000, but they dropped the price on October 2 to $278,000 and immediately went under contract. After Michael hit the following week, that deal headed south and it came back on the market with its current list price of $259,000. On Tuesday they finally made it across the finish line and closed for $235,000. 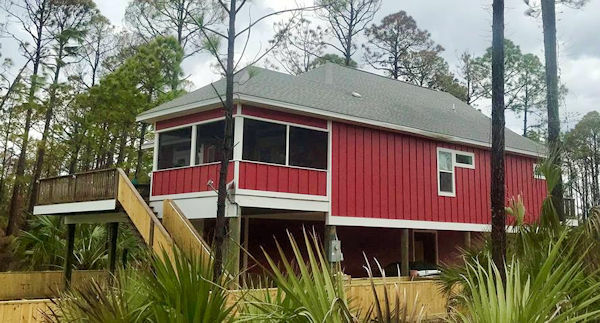 Now on to our three new contracts, the first of which is on this 4-bedroom, 3-1/2-bath, 2,366 square foot first tier Cape San Blas home on Haven Road. The sellers bought it in the summer of 2008 for $720,000. 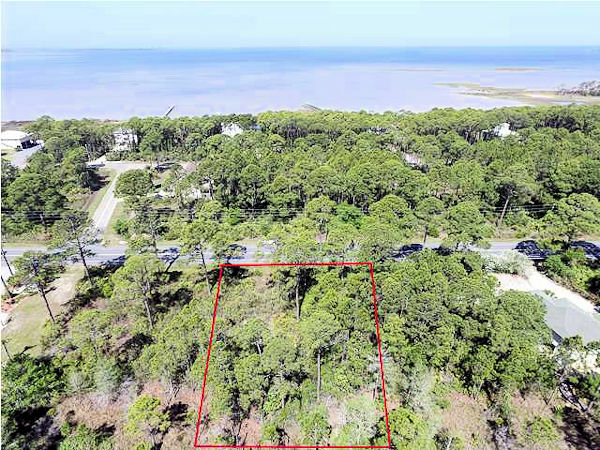 Down on the south side of the Cape, buyers were attracted to these two adjacent lots on Mercury Lane in Surfside Estates listed for $142,000. Together they measure 100′ x 230′, for a total of 0.54 of an acre. 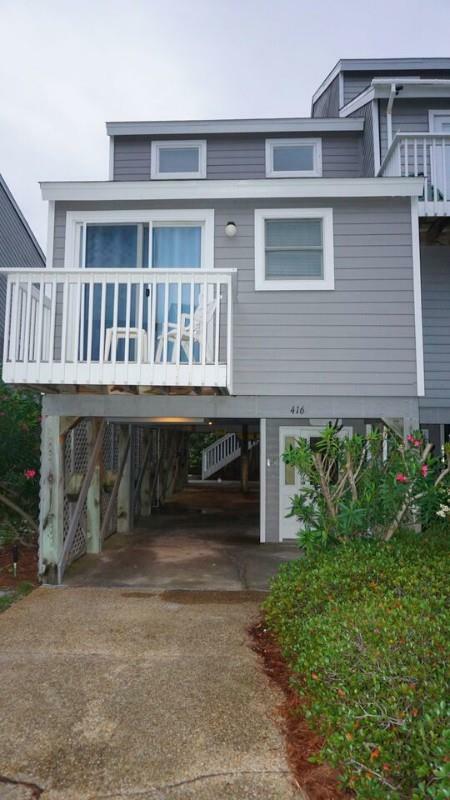 They sit first tier and offer excellent views of the Gulf as well as easy access to the beach. Our third contract is out on C-30 past the Indian Pass Raw Bar. Buyers had their offer accepted on this 3-bedroom, 3-1/2-bath, 2,000 square foot home in a lovely country setting. It was built in 2000 on a 200′ by 200′, 0.92-acre lot. The sellers bought the home in February just last year for $335,000, and have it listed for $379,000. Housing is in critical demand locally, so if you have a house, townhouse or condo you’ve been considering selling, now is a good time to run the numbers, even if it sustained hurricane damage. We can make adjustments for that, so let’s talk. You can always reach me by calling or texting 850-227-5197 or emailing sherri@sherridodsworth.com. Hope to hear from you soon, and, as always, I thank you so much for taking time out of your busy schedule to stop by today.